This is an emulation of the Chip-8 processor running in Unity. It's a work in progress and if people are interested I can work on it further. 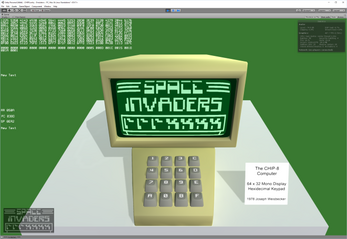 I do love the idea that space invaders can be written in a few kilobytes in Unity when you write an emulator. Still a bit buggy but maybe you can work out the keys to play space invaders and provide some feedback. Note all that hexidecimal text is the entire code for the game.